UDM Downloads > PST to Word! PST to Word converter is a PCVITA program to convert PST to word DOC without any complexity. To know about, how to convert PST to word you only need to install PST to word converter on your machine and convert PST file to word file. With PST to Word conversion you can easily edit you emails with all the rich text options and also save these emails in your machine for future use. With this PST to word converter you can easily change your emails in PST format into RTF file formats so that emails can be opened in DOC file format that is MS Word. Apart from PST to word conversion, this software has the capability to convert PST to EML, PST to MSG, PST to MHT, and PST to HTML etc. 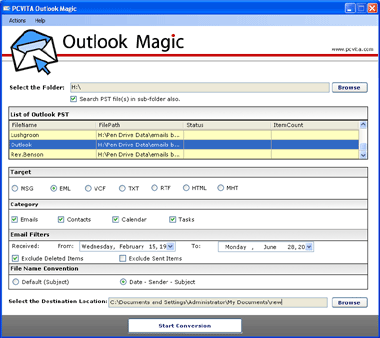 This PCVITA Outlook Magic can convert multiple emails in Outlook PST files to word so that you can open them in Word file and edit them as you want. We provide you an opportunity to put us on the test by operating our free downloadable demo version to convert PST to Word DOC file. This demo can convert first 15 emails from PST file to word file to clarify the process. Once you satisfied go for the comprehensive and complete version in $15 that can be downloaded online. Our 24x7 support is with you to guide your queries and complaints accordingly.